When I ask individuals what they want to achieve from investing their savings in the markets, overwhelmingly, they respond with something along the lines of wanting high returns and protection from large losses. Given that most individuals with professionally managed investment portfolios are invested in a diversified portfolio of one kind or another, it is not surprising to me that many investors often find themselves less than satisfied with their investment results during both good and bad markets. During strong bull markets, like we have enjoyed over the last seven years, investors become completely focused on returns. Over the last two years investors have watched the S&P 500 advance by double digits each year, when they compare those returns against their diversified portfolios they often find they have returned half, or less, than the S&P 500. These performance results make them unhappy. During times of economic turbulence like in 2008 and 2009 investors stop focusing on returns and become completely focused on risk as they watch with dismay as their investment portfolios decline by a third, or more, which makes them even more unhappy. Investors are not entirely to blame for being discontent with the performance of their diversified investment portfolios, the investment management industry carries much of the blame for investor dissatisfaction. The industry routinely reinforces unrealistic return expectations and designs and sells inefficient one-size-fits-all diversified portfolios to achieve multiple unrelated investment objectives. Like most complex things in life, there is rarely a simple one-size-fits-all solution to solving complicated challenges. The best solution is almost always more nuanced, and high-quality investment management is no different. Thus far, I used the generic term “high returns” to define common portfolio return objectives people have for their portfolios. The definition of “high returns” is unique to each individual and more broadly fails to quantify the goal for portfolio returns. The best method for defining your risk and return objective is to identify exactly what you seek to accomplish by investing your savings in the markets. This exercise will help bring clarity to the more important question of just how high your returns must to be to achieve your investment objectives. It then becomes possible to identify the specific investment approach or approaches that are most likely to accomplish each investment objective individually as well as the amount of risk that will be required. I use the following investment return objectives to help clients identify what they want their investment portfolio to accomplish. Investing with the goal of earning returns that significantly increase your net worth. 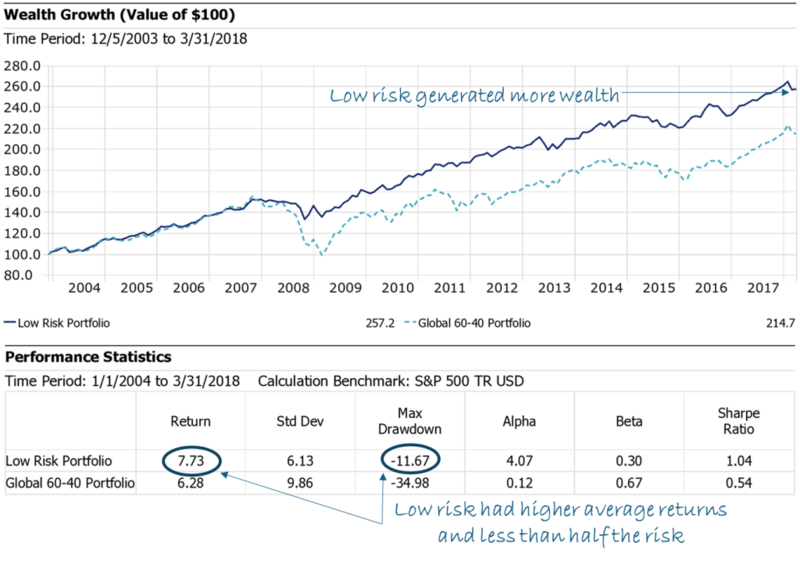 Depending on how high the returns you seek are, the risk required may be equal to the risk of investing in the S&P 500 all the way up to the risks equivalent with starting or investing in a single business (about 70 to 80 percent of business fail in the first 10 years). Investing with the goal of moderately increasing your wealth over time with the primary purpose of protecting your assets from inflation. The risk taken to achieve this objective should be significantly less than investing in the S&P 500. The largest fortunes have been created through concentrated financial exposure. Consider Bill Gates, much of his fortune was created from founding Microsoft and holding on to huge amounts of Microsoft stock. As his Microsoft stock experienced dramatic appreciation with the success of the company, so did his wealth. Had Gates sold a large portion of his Microsoft stock after the Microsoft IPO and then diversified into hundreds of companies, he would not be anywhere near as wealthy today. 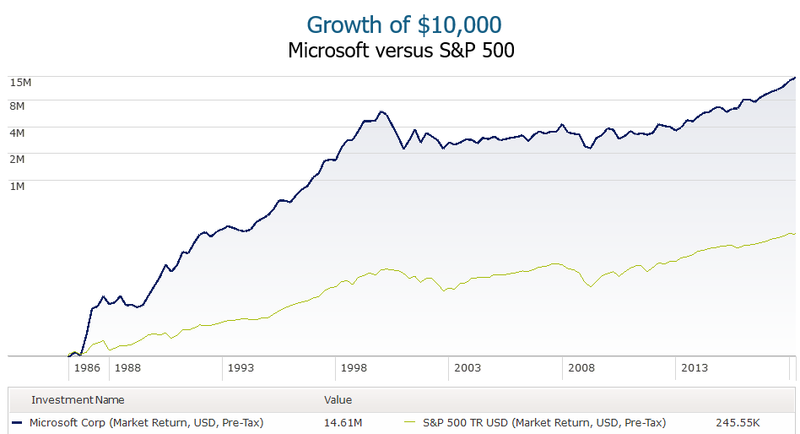 The chart above shows that $10,000 invested in Microsoft in 1986 would be worth $14.1 million today, whereas the same investment in the S&P 500 would be worth only $245.5 thousand. The S&P 500 is a highly diversified index of stocks, this chart demonstrates how diversification lowers the potential for returns. With each additional stock you add to a portfolio the more the portfolio begins to behave like the overall stock market in terms of both the risk taken and the returns received. While diversification limits potential returns, it also dramatically reduces the risk of loss. Imagine if Bill Gates had suddenly died in 1988, it is very possible the chart above would look much different today. What if Microsoft has an accounting scandal next year? The value of the stock could quickly become close to zero. The point is that concentrated financial exposure is very risky and can produce dramatic outcomes, both positive and negative. When seeking to create significant wealth through investing you must be willing to take more concentrated financial positions and accept the substantially higher risk and increased odds of failure that come along with a concentrated investment approach. For these reasons, a concentrated investment approach is not compatible with the objective of gradually accumulating and protecting wealth over time. Inflation is the enemy of wealth accumulation! Inflation is the biggest threat individuals face to long-term financial security and is the one reason why savers in all stages of life should invest their savings. In my opinion, investing in a high quality diversified portfolio is much less risky over the long-term than allowing your savings to be devoured by inflation. What the table above shows is that if you put $1 in a savings account in 1988, that same dollar would be worth 111% less today in terms of spending power. This loss in value from inflation of each dollar saved does not even account for the lost opportunity of earning positive returns in excess of inflation by investing that dollar in the markets. The best way to think of inflation is compounding returns in reverse. There is a large price to be paid for being unwilling to except some level of investment risk. Comprehensive diversification is the best investment approach for accumulating and moderately growing your wealth over time while also protecting your assets from large losses. Diversification does not make you wealthier fast, but it is a great strategy to make you wealthier over the long-term and just as importantly to keep you wealthy. However, because diversification limits total return potential of a portfolio, a diversified approach to investing is not compatible with the objective of dramatic wealth creation. Most investors struggle to select just one of the previous two investment objectives when given the choice between wealth creation and wealth accumulation because they really would like to choose both. They do not want to bet the farm and select only wealth creation and they understand the importance of gradually accumulating and protecting their wealth over time but limiting their potential for outsized returns is not terribly attractive either. What is an investor to do? Understanding the universal nature of this investment dilemma, the investment industry designs and sells what I call Swiss Army portfolios. Swiss Army portfolios are positioned by investment firms as an all-in-one investment solution capable of generating outsized returns while safely accumulating wealth by limiting risk through diversification. These portfolios often go by names like growth portfolio or aggressive growth portfolio. The idea sounds great and appeals easily to the human desire for simple, easy to understand solutions to complex problems. What is not to like about a simple approach to safely growing wealth while preserving the possibility for outsized returns? The problem with the Swiss Army approach is that the primary impediment to generating outsized returns is diversification and the primary impediment to efficiently accumulating wealth is too much risk. Because the multiple return and risk objectives compete with one another, it is not possible to create one investment approach that achieves all desirable return objectives for all people. I call these industry standard all-in-one portfolios Swiss Army portfolios because they function much like a Swiss Army knife. A Swiss Army knife can be used to cut through a steak as well as open a can of beans, but these unrelated tasks are not completed easily or particularly well by a Swiss Army knife. Simple tools have been designed to efficiently accomplish each of these tasks individually and with a higher quality result than a Swiss Army knife. For example, one could use a chef’s knife to cut a steak and use a can opener to open a can of beans. This is why we do not stock our kitchens with only a Swiss Army knife, but instead a full array of purpose-built tools. Swiss Army portfolios are usually too risky and therefore do not accumulate wealth efficiently and they have an extremely low probability of creating significant wealth from outsized returns because they are diversified. By creating a portfolio that attempts to achieve multiple, unrelated and competing investment return objectives, the portfolio is most likely to achieve none of the investment objectives. It is possible to accumulate wealth and provide yourself the opportunity to create significant wealth by generating outsized returns, all within a single investment portfolio! Spoiler alert, the solution is not to invest in a Swiss Army portfolio. 3Summit’s solution is to split a single portfolio into two separate partitions. This simply means managing a single portfolio as if it is two separate portfolios. After gathering an investors total financial picture, appropriate allocation sizes to each partition of the portfolio can be decided. The partition with the investment objective of wealth accumulation is then invested in a comprehensively diversified, low risk portfolio. The second partition with the investment objective of wealth creation is invested in a concentrated portfolio that is minimally diversified. A partitioned portfolio structure then sets the portfolio up to achieve otherwise competing investment objectives independently using the best investment approach for each investment return objective and therefore increasing your probability of successfully achieving both objectives. Grow wealth over time by earning returns that are moderately above inflation after fees. Managing risk and protecting assets that are being actively drawn upon or will soon be drawn upon to fund retirement or large expenses like college educations. Manage assets dedicated to regular charitable giving over long periods of time. Offsetting concentrated financial risk from ownership in a business, large amounts of employer stock options or extensive real estate holdings. Conservatively managing wealth to be transferred to future generations. Despite the many great reasons to include a diversified investment approach as a part of your overall financial plan, it is still the primary source of investor discontent. Diversification can produces seemingly low returns when compared to the broad stock market and unexpectedly large losses that can be a major source of frustration for investors who believed their portfolio was less risky than it turns out to be. These sources of investor frustration can easily be solved by properly implementing diversification. Diversification must be implemented correctly to grow wealth efficiently over time and prevent large unexpected losses. It is possible to create a low risk, diversified portfolio that both grows your wealth and prevents large unexpected losses. Excess risk is the trap Swiss Army portfolios fall into by sacrificing the quality of diversification to reach for higher returns. In a previous letter I explained why all methods of diversification are not created equal (here), for a deeper dive into diversification techniques I would recommend this reading. Properly implementing diversification requires more than just investing in many individual securities and different asset classes like stocks and bonds. The table below shows the different sources of diversification used in a 3Summit Low Risk portfolio versus a Swiss Army portfolio. The result of comprehensive diversification like that used in the Low Risk portfolio is dramatic. The chart below compares the growth of a $100 dollars invested in both the 3Summit Low Risk portfolio and the Swiss Army portfolio over the same timeframe. The Swiss Army portfolio is represented by a portfolio invested 60% in a global stock index and 40% in a global bond index. This hypothetical portfolio comparison shows that over the time period analyzed, the Low Risk portfolio generated more wealth, higher average annual returns and had about one third the risk of the Swiss Army portfolio! The reason the Low Risk portfolio generated more wealth than the Swiss Army portfolio is because the portfolio produced more consistent returns and limited the size of investment losses. The largest loss over the time period analyzed between 2004 and 2018 for the Low Risk portfolio was only -11.6% versus -34.9% for the Swiss Army portfolio. When managing diversified portfolios excess risk is very inefficient because you are not likely to be compensated for the extra risk in terms of greater wealth growth because of the additional time required to recover from large losses. Diversified portfolios are the tortoise in the classic story The Tortoise and the Hare. A diversified portfolio grows your wealth over time by generating modest but consistent returns while preventing large losses along the way. Before getting discouraged with your diversified portfolio returns it is important to take a long-term view. The tortoise (low risk diversified portfolio) will at times generate lower average returns than the broad stock market, but will also generate much smaller losses, this is by design. Long-term results are what matter if you want to win the race. *Model Portfolio DisclosureHypothetical Portfolio Analysis Disclosures – This analysis is designed to be a hypothetical view of how specific asset class allocations would have performed in the past. The portfolios represented do not represent live traded or managed portfolios. The data presented is for educational purposes only and is not investment advice. Historical data may not be accurate. The asset classes are represented by mutual funds, indexes and research datasets. The proxy data used for asset class returns cannot be directly invested in or traded. The 3Summit Portfolio is represented net of a 1% annual management fee. Backtested Performance Disclosure Statements – 3Summit Investment Management is a registered investment adviser. Information presented herein is for educational purposes only and does not intend to make an offer or solicitation for the sale or purchase of any specific securities, investments, or investment strategies. Investments involve risk and unless otherwise stated, are not guaranteed. The performance indicated for the model portfolios is back-tested. Back-tested performance is NOT an indicator of future actual results. There are limitations inherent in hypothetical results particularly that the performance results do not represent the results of actual trading using client assets, but were achieved by means of retroactive application of a back-tested model that was designed with the benefit of hindsight. The results reflect performance of a strategy not historically offered to investors and do NOT represent returns that any investor actually achieved. Back-tested results are calculated by the retroactive application of a model constructed on the basis of historical data and based on assumptions integral to the model which may or may not be testable and are subject to losses. Back-tested performance is developed with the benefit of hindsight and has inherent limitations. Specifically, back-tested results do not reflect actual trading, or the effect of material economic and market factors on the decision making process, or the skill of the adviser. Since trades have not actually been executed, results may have under- or over-compensated for the impact, if any, of certain market factors, such as lack of liquidity, and may not reflect the impact that certain economic or market factors may have had on the decision-making process. Further, back-testing allows the security selection methodology to be adjusted until past returns are maximized. Actual performance may differ significantly from back-tested performance. Model Performance Disclosures – 3Summit Investment Management is a registered investment adviser. Information presented herein is for educational purposes only and does not intend to make an offer or solicitation for the sale or purchase of any specific securities, investments, or investment strategies. Investments involve risk and unless otherwise stated, are not guaranteed. Readers of the information contained on this handout, should be aware that any action taken by the viewer/reader based on this information is taken at their own risk. This information does not address individual situations and should not be construed or viewed as any typed of individual or group recommendation. Be sure to first consult with a qualified financial adviser, tax professional, and/or legal counsel before implementing any securities, investments, or investment strategies discussed. The performance shown represents only the results of 3Summit Investment Management’s model portfolios for the relevant time period and do not represent the results of actual trading of investor assets. Model portfolio performance is the result of the application of the 3Summit Investment Management’s proprietary investment process. Model performance has inherent limitations. The results are theoretical and do not reflect any investor’s actual experience with owning, trading or managing an actual investment account. Thus, the performance shown does not reflect the impact that material economic and market factors had or might have had on decision making if actual investor money had been managed. Model portfolio performance is shown net of the model advisory fee of 1.00% the highest fee charged by 3Summit Investment Management and sample trading costs based on our Custodian Interactive Brokers’ trading costs. Performance does not reflect the deduction of other fees or expenses, including but not limited to brokerage fees, custodial fees and fees and expenses charged by mutual funds and other investment companies. Performance results shown include the reinvestment of dividends and interest on cash balances where applicable. The data used to calculate the model performance was obtained from sources deemed reliable and then organized and presented by 3Summit Investment Management. The performance calculations have not been audited by any third party. Actual performance of client portfolios may differ materially due to the timing related to additional client deposits or withdrawals and the actual deployment and investment of a client portfolio, the reinvestment of dividends, the length of time various positions are held, the client’s objectives and restrictions, and fees and expenses incurred by any specific individual portfolio. Benchmarks: The Hypothetical 3Summit Low Risk Portfolio performance results are compared to the performance of a blended benchmark. The blended benchmark consists of a 60% allocation to the MSCI ACWI NR with dividends reinvested and a 40% allocation to the Barclays Global Aggregate Bond Index with continuously reinvested coupon payments. Return Comparison: The MSCI ACWI NR represents the world stock market including emerging markets and was chosen as a good representation of global stock market exposure. The Barclays Global Aggregate Bond Index represents the world total bond market and was chosen as a good representation of global bond exposure. The results do not represent actual trading and actual results may significantly differ from the theoretical results presented. Past performance is not indicative of future performance. 3Summit Investment Management, LLC is a registered investment adviser. Investing involves risk, including the loss of principal. Investments will not always be profitable, and we do not provide any guarantees. Security prices and market conditions may change unpredictably and rapidly, diversification does not eliminate the risk of loss. Past performance is no guarantee of future results. 3Summit Investment Management, LLC is a registered investment adviser. Information presented is for educational purposes only and does not intend to make an offer or solicitation for the sale or purchase of any specific securities, investments, or investment strategies. Investments involve risk and, unless otherwise stated, are not guaranteed. Be sure to first consult with a qualified financial adviser and/or tax professional before implementing any strategy discussed herein. Past performance is not indicative of future performance. Copyright © 3Summit Investment Management, LLC, All rights reserved.